Senegal: Product Development | Senegal: A Full Circle Story | Product development with artisans in Ndem, Senegal. The 3form product development team traveled to Ndem, Senegal to work side by side on unique interlayers with the artisans there. 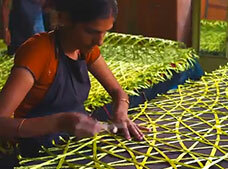 The work these craftspeople do contributes to the overall design of 3form products. This is an essential part of creating viable employment as well as intriguing and on-trend building materials.